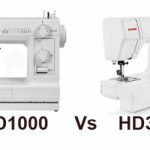 Filtered list of 5 best sewing and embroidery combo machines you can get in U.S. Priority is given for beginners or home machines. 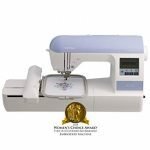 The best thing about sewing and embroidery combo machines is that you can do away with a regular sewing machine, as you are getting a machine that can do both sewing and embroidery. A decent sewing machine with advanced features will cost at least $200 – $300 in U.S and a beginners embroidery only machine will cost anywhere between $500 – $700. What if you can get a combo machine that can do both sewing and embroidery at half the price of an embroidery only machine ? That is where the class of combo machines come into play. Sewing and embroidery combo machines can do all the sewing and embroidery works. However you won’t be able to everything you can do on an embroidery machine, but most of the work can be done on a combo machine. 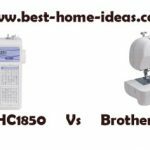 Now, let us have a look at the best 5 sewing and embroidery combo machines that suit beginners for home use. The selection is strictly based on quality and performance, so you may not see all the machines you see in your local store. To be honest, there are only a handful of quality machines out there, so my selection was not that difficult. 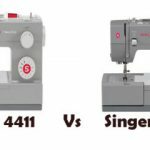 Whenever you search for a sewing and embroidery combo machine, this will be the first in search results, irrespective of the search engine or the website you use. There is simply no good enough competitor for this machine. It has been sitting pretty on the top for years now. The success story of Brother SE400 is based on 3 factors, advanced features, excellent performance and unbeatable price. I haven’t seen this magic formula work out better than it worked out for SE400. Sometimes you won’t get the right features or the price or the performance won’t be as good as expected. But SE400 has all those three things in combination. This is also the least expensive machine among the five machines in this list. SE400 comes with 67 sewing stitches and 70 built-in embroidery designs with 5 lettering fonts. It has an embroidery area of 4″x4″. USB connectivity lets you import designs from the internet, so that you don’t feel limited with the 70 designs on-board. Ease of use wise, this is one of the best you can get. You will also get advanced sewing features like automatic needle threader, automatic thread cutter, programmable needle up/down etc. 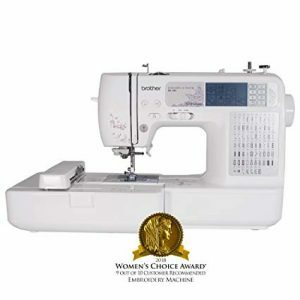 In a nutshell, Brother SE400 is the best sewing and embroidery combo machine you can get in U.S. That is the reason why it was listed in ‘Machines You Can Buy With Your Eyes Shut’ category. Cons : The only issue is that, advanced users might consider the embroidery area of 4″x4″ slightly small for their liking. Other than that, it is a flawless machine. LB6800PRW is identical to SE400 except that it has a Project Runway branding. The machines are identical and you won’t be able to make out the difference. One striking difference is of course the price, there used to be a huge difference at the time of writing this post. Personally I don’t recommend this machine because of the price difference (it may change according to shopping seasons, so please compare the prices). The extras you will get are rolling bag, 1 additional feet and a felt. I really don’t feel that I need a rolling bag for my machine and I am not ready to spend a lot of money for that. I will always go with SE400. Now you may ask why I put LB6800PRW in the second position. It is because of the quality and features (the same as you get on SE400). I would consider LB6800PRW as a good deal over SE400, only if the price difference is just around $40 or so. Otherwise I will go with SE400. Cons : High price, a huge bummer for sure. XL-550 is the best combo machine from Singer. It is feature rich and is a great performer. 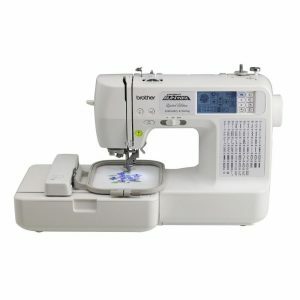 It has a whopping 215 built-in sewing stitches and 125 built-in embroidery designs with 20 fonts and outline lettering. It has a large embroidery area of 10″x6″ with multihooping capability, with which you can do bigger designs than the original hoop size. Two hoops comes included, 10″x6″ and 4″x4″. This is an ideal machine for advanced users and professionals. You will get AutoPunch, HyperFont & Advanced Editing Softwares included, which clearly justifies the price of this machine (First look always makes you feel that it is very expensive). The stitch quality is excellent on all types of fabrics. It adds a professional finish to your projects. Cons : All advanced editing is done on PC/laptop, with the help of included softwares. Literally, you need the machine to be connected to the laptop/PC every time you need to operate it. Singer XL-550 does feature an LCD screen, but it is limited to stitch selection only. 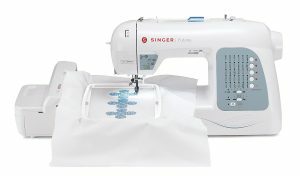 Singer XL-400 focuses more on embroidery than on regular sewing. It has much more embroidery features than the previous two Brother machines in this list, but it is lesser on sewing features. 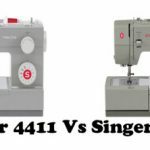 XL-400 is the second best combo machine from Singer and it is also the least expensive of all combo machines rolled out by Singer. It features 30 sewing stitches and 125 embroidery designs and 5 lettering fonts. Large 10″x6″ embroidery area is the highlight of this machine. The machine comes with two hoops 10″x6″ and 4″x4″. A unique feature of this machine is that, it doesn’t have an LCD screen, all the editing and customization needs to be done on a laptop/PC using a digitizing software. Now, this might cause some inconvenience as you need your laptop connected whenever you need to work on something. Other than that, there are not many things to worry about. The stitch quality and performance is quite good. Cons : It could have been priced better. At this price, people will expect it to feature an automatic thread cutter. Autopunch software is not included, so the level of customization is limited. If you buy autopunch separately, it will cost a lot of money. That makes the pricing of this machine even worse. Consider this machine only if you have a lot of money in your pocket (well over $1000). 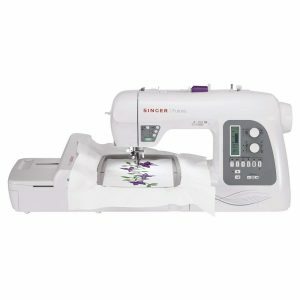 Singer Xl-580 is not a beginners sewing and embroidery combo machine at all, it is designed for full time professionals. It features 215 built-in sewing stitches and 250 built-in embroidery designs. In addition to 10″x6″ and 4″x4″ hoops, you will also get 6.75″ x 4″ which allows you to create border designs on tablecloths, fashions and draperies. Xl-580 comes with a knee lifter as well. The USB key on this machine lets you edit designs without your laptop being connected to the machine. Cons : Very expensive when compared to XL-550 which is very similar, except that it lacks knee lifter, USB key, endless hoop and 125 less embroidery designs.